A bike rider may ride a bicycle on any public road, bikeway, or street in the state so long as it is not an express limited-access highway that has posted signs saying that bicycles are not permitted. A bike rider may ride on the sidewalk so long as the sidewalk is not in a designated business district. There may however be local ordinances that prohibit bike rider from riding on sidewalks in designated areas, and these local ordinances will be generally deemed enforceable. A person on a bike may pass cars on the right. This is different from the laws involving cars that generally prohibit passing another vehicle on the right. A bike rider must signal when turning or stopping, but may use either hand when turning and stopping. These are the hand signals still taught on the written driving test, so all drivers are expected to know what the various signals mean. A bike rider can have as many lights and reflectors as they so desire. With these rights, there are also responsibilities, and they generally amount to following basic traffic laws including stopping at traffic signals and stop signs. This brings up a big issue. There is a misconception that most if not all bike riders except to have the rights to the road and then ignore most traffic regulations they are required to follow. As our Boston bike crash accident lawyers can explain, this is simply not true. The vast majority of bike riders do follow laws and act responsibly, but this is a classic example of where a few bad apples ruin the reputation of everyone. Hopefully those riders who do not adhere to traffic laws and blow though intersections without looking or stopping, will stop this irresponsible behavior. This does however, bring up an important issue. In some cases, a bike rider may have violated some traffic law around the time he or she was involved in a bike crash. If the traffic violation was not related to the bike crash, then it should not affect liability. There is something known as negligence per se, which means that if a person violates a state law or local ordinance, he or she will be deemed negligent without having to prove a duty of due care was owed, or that the defendant breached the duty of due care. There will still be a requirement to prove breach of the duty of due care resulted in damages that were actually and proximatly caused by defendant’s violation of the ordinance. While this was the common law standard, it has been changed somewhat by the courts in Massachusetts in that the law or ordinance allegedly violated must have been created to prevent the type of harm that was caused in the accidnet. For example, if a bike rider came to an intersection with a two-way stop sign and failed to stop at the sign, and was then hit by a driver who traveling though the intersection in the perpendicular direction who had no stop sign, that would be a violation of the traffic law committed by the bike rider that resulted in the type of harm the statute was enacted to prevent. On the other hand, if a bike rider was riding with on a street and was three abreast with other riders, when the law states a maximum of two abreast, and travels though an intersection with right of way only to a be hit by car that blew a stop sign, this would be a violation of the traffic laws on behalf of both plaintiff and defendant. However, the two abreast law was created so bike riders would not interfere with traffic moving in the same direction so that violation did not result in any harm, let alone the harm the statute was enacted to prevent from occurring. This would therefore not be an example of negligence per se. 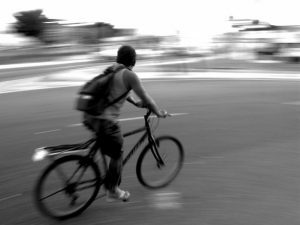 In a recent article from the Boston Herald, a 15-year-old boy suffered a very serious head injury and was left in critical condition following a Worcester, Massachusetts bike crash. Authorities say the teen victim feel off his bicycle and then was then hit by an SUV. While the investigation has not been completed, it is believed the boy was hit by the back tire of the SUV after he had lost control of his bike and was ejected onto the roadway. When first responders arrived at the scene of this serious Boston area bike crash, they found the victim to be critically injured. They did what they could to stabilize him before rushing him to a local level one trauma center for emergency surgery and follow-up treatment in the critical care unit (CCU). The driver of the SUV was not initially cited with any moving violations and it is unknown whether he will be until the investigation is complete. In many bike accidents, the rider is thrown from the bike and has very little protection. Even when wearing a helmet, there is little protection because the helmet is not designed to withstand the blow from a car or hitting the concrete with tremendous force. There is also the possibility of a concussion or other type of traumatic brain injury caused by blunt force trauma in a closed head wound. A concussion occurs when the brain, which is suspended in fluid, slams against a layer of tissue inside the skull called the dura. It is not necessary for the victim to suffer an open head wound to get a concussion or other type of traumatic brain injury (TBI).